Pepper Stetler, Associate Professor of Art History, received her B.A. from Barnard College (2001) and her M.A. and Ph.D. (2004, 2009) in Art History from the University of Delaware. 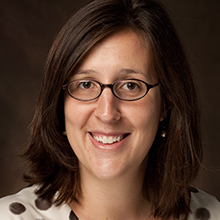 Professor Stetler’s research focuses on the art and visual culture of early twentieth-century Europe. Her book Stop Reading! Look! : Modern Vision and the Weimar Photographic Book, published by the University of Michigan Press in 2015, provides a new perspective on the prominence of photography in Germany Weimar Republic (1918-1933). It addresses how the display and sequencing of photographs in books relates to contemporary debates on modern visual experiences. Photographic books by Laszlo Moholy-Nagy, Albert Renger-Patzsch, Karl Blossfeldt, Helmar Lerski, and August Sander figure prominently in her research. Her current research focuses on the interaction between photography and architecture. She has received support for her research from the Berlin Program for Advanced German and European Studies at the Freie Universität in Berlin, the Getty Research Institute, the Research Forum of the Courtauld Institute of Art, the German Academic Exchange Service, and the Gerda Henkel Stiftung. At Miami, Professor Stetler teaches courses on the history of photography and modern art. Her students have curated exhibitions at the Miami University Art Museum on art of the 1970s and documentary photography. She enjoys taking students on an annual trip to New York City to meet with Miami alums working in the arts. In 2016 she received the College of Creative Arts Crossan Hayes Curry Distinguished Educator award. Stop Reading! Look! : Modern Vision and the Weimar Photographic Book (Ann Arbor: University of Michigan Press, 2015). Modern Architecture and the Book, a special issue of the Journal of Architecture, co-edited with Julia Walker 20 no. 4 (August 2015). “Reading Max Taut: Bauten und Pläne,” Journal of Architecture 20 no. 4 (August 2015). “The Object, the Archive, and the Origins of Neue Sachlichkeit Photography” History of Photography 35 no. 3 (August 2011) 281-295. Awarded the Emerging Scholars Essay Prize from the Historians of German and Central European Art. “ ‘The New Visual Literature’: László Moholy-Nagy’s Painting, Photography, Film,” Grey Room 32 (Summer 2008) 88-113. “Surrealism between Reality and Dream,” in Photography at MoMA: 1918-1960 (New York: The Museum of Modern Art, 2016). “Man and Machine,” in New Objectivity: Modern German Art in the Weimar Republic, 1919-1933 Stephanie Barron and Sabine Eckmann, eds. (Los Angeles County Museum of Art, 2015). “Franz Roh and the Art History of Photography.” In Mitra Abbaspour, Lee Ann Daffner, and Maria Morris Hambourg, eds. Object:Photo. Modern Photographs: The Thomas Walther Collection 1909–1949. An Online Project of The Museum of Modern Art. New York: The Museum of Modern Art, 2014. “Photography and Society” and “Social Documentary Photography” in Photography: The Whole Story edited by Juliet Hacking (London: Thames and Hudson, 2012). “Art History without Words: Foto Marburg’s Photographic Books,” Photo Archives and the Photographic Memory of Art History edited by Costanza Caraffa and Patricia Rubin (Berlin: Deutsche Kunstverlag, 2011) 313-322.